The middle-class bourgeois is ripe for satire, and has been for many years, but so few are as tight and direct as Sally Potter’s The Party, which somehow manages to get across everything it wants to say in just over an hour – yes, this is a very quick in-and-out movie at just 71 minutes, but for each one of those small amount of minutes you’re sat there witnessing the most uncomfortable dinner party ever, and taking great pleasure in watching these middle-class types fall apart like cooked chicken from the bone. The set-up is that Janet (Kristin Scott Thomas) has just been appointed shadow minister for health for an unknown political party, and has invited a few friends over for a drink to celebrate. As the guests soon arrive, including the opinionated cynic Alice (Patricia Clarkson) and her embarrassment of a partner in spiritual intellectual Gottfried (Bruno Ganz), women’s studies professor Martha (Cherry Jones) and her partner Jinny (Emily Mortimer) who have just learned they’re expecting triplets, and city banker Tom (Cillian Murphy) whose wife Marianne is arriving later, and for reasons that later become apparent is stressed at just being there, snorting cocaine in the bathroom and is even carrying a gun. The evening, as you can imagine, gets off to a fairly awkward start, and is made even more so when Janet’s husband Bill (Timothy Spall) drops a huge bombshell that causes the evening to quickly descend into chaos. Part of the fun is watching this whole thing unfold in real time, with these people that for their own individual reasons are acting pretty snappy or anti-social when things kick off, only for them all to escalate further and further over the course of just past the hour mark. Shot in stark black-and-white, and never venturing outside this one house, it leaves you feeling utterly trapped as you watch these increasingly insecure people snap at each other, and just as transfixed by Potter’s ability to make it all feel as nauseating as being at a house party where you’re the only sober one and forced to watch your inebriated friends make it a far more awkward night than it ever needed to be. However, this miniscule deconstruction of the middle-class regime is rather funny in how the smallest things can be the one to cause the crack that expands until it all crumbles apart, and a lot of laughs are delivered from these characters’ personalities clashing with one another as the evening gets more and more unbearable. In just a short amount of time, the entire cast are able to create amusing caricatures that leave a great impact on the viewer, particularly Clarkson whose back-handed comments about people’s own accomplishments are as cynical and dryly-delivered as someone like her could pull off easily, and Potter both writes and directs this miniature circus of sophisticated depravity with a clear sharp edge that doesn’t need any more minutes to fully explore. When the time comes for it to actually wrap up so soon, it’s an abrupt but rather perfect note to go out on, one that raises more questions about these already questionable people while also exposing some of their greatest human flaws without going into too much detail. Whether anyone would find this a worthwhile sit is entirely up to the individual, but whatever you come away thinking about it, you’ll be in and out before you know it, and recovering from the perfectly brief whack on the head that this movie wittingly throws in your direction. 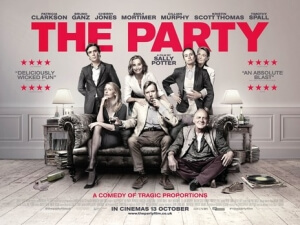 The Party is a short but sharp satirical takedown of the middle-class bourgeois and exposes the deep characters flaws of these sophisticated types, leaving you trapped at this increasingly hostile get-together where you can’t help but take utter joy in their misery.